This counter top brochure holder is revolving. It is available for brochures 4"w x 9"h and 8 1/2"w x 11"h. The revolving feature of this brochure holder allows for better accessibility and customers have an easier time browsing. Black acrylic design blends well with any décor and gives added contrast to the brochures on display. This item is available in two different sizes to accommodate your specific needs. The free standing design allows you to place this brochure holder in many different areas without using too much space. 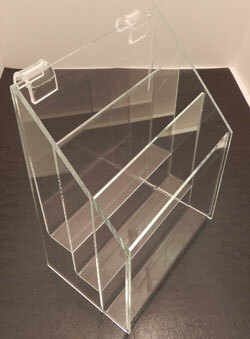 This acrylic brochure holder has 3 tiers with 4 pockets per tier, for a total of 12 brochure display pockets. It is constructed to accommodate brochures 4"w x 9"h or smaller. This three tier acrylic brochure holder features 1 display pocket per tier, for a total of 3 display pockets. It is available for brochure sizes 4"w x 9"h and 8 1/2"w x 11"h.
This acrylic brochure holder features 3 tiers with 3 pockets per tier, for a total of 9 brochure display pockets. It is freestanding and can also be wall mounted. It is available in 2 sizes. 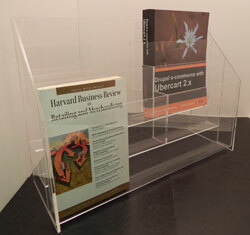 This three tier acrylic brochure holder features 2 display pockets per tier, for a total of 6 display pockets. It is available for brochure sizes 4"w x 9"h and 8 1/2"w x 11"h.